If you haven’t yet been able to play on Release 12 of Oracle EBS, now is your chance. Solution Beacon now has a Release 12 instance (12.0.0 Vision Installation from Media Pack/10.2.0) of the Oracle Vision Test System publicly available. The Release 12 Vision environment uses the same underlying java framework as normal Oracle Applications Release 12. In Release 12 the Oracle JInitiator plug-in required by Release 11i is no longer used. Instead, the default JVM installed by Java 5.0 is used. If you do not already have Java 5.0 installed, it will be installed automatically when accessing Forms mode the first time. In order to allow the Java 5.0 plugin to be installed automatically, click Tools->Internet Options->Security->Trusted Sites. Then, click on the “Sites…” button. Enter *.solutionbeacon.net in the “Add this Web site the the zone” field and click Add. Make sure that “Require server verification (https: ) for all sites in this zone” is unchecked. We have had many users send us email requesting help with getting the Oracle Forms mode interface to work. In most cases we have found the problem is due to popup blocking software. Before sending us an email requesting help, check to be sure that you do not have popup blocking software enabled. The Oracle Forms mode interface needs to open several additional browser windows and if it is blocked, Oracle Forms will fail to load. 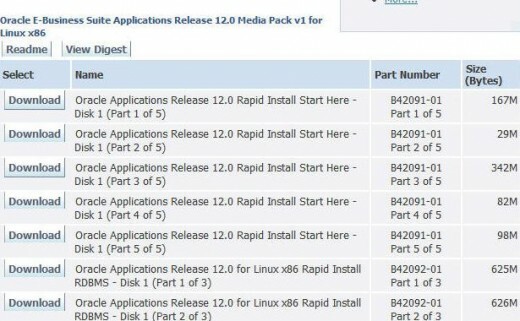 Following the recent release of the Oracle EBS 12i media packs, Oracle has now released the full documentation pack for download. You can download the entire documentation CD (only 408.08MB this time) or the individual documents as illustrated below. A lot more posts will be coming up on R12 in the next few days, keep an eye on my del.icio.us R12 links to see what’s on my radar screen. I noticed that E-Business Suite Release 12 is Generally Available, I’m busy downloading it from Oracle’s e-delivery web site. It’s a pretty hefty download, the Linux media pack consists of 72 items totalling 35GB in size. RCD’s for Oracle E-Business Suite Release 12 are now available on Metalink. According to Metalink note 404152.1 (username and password required) - this document contains links to the published Release Content Documents for Oracle Applications, E-Business Suite Release 12. The RCD or Release Content Documentation communicates information about new or changed functionality in the specified release of the Oracle E-Business Suite. Existing functionality from prior point releases is not described. Use this document as a launchpad for R12 RCDs.